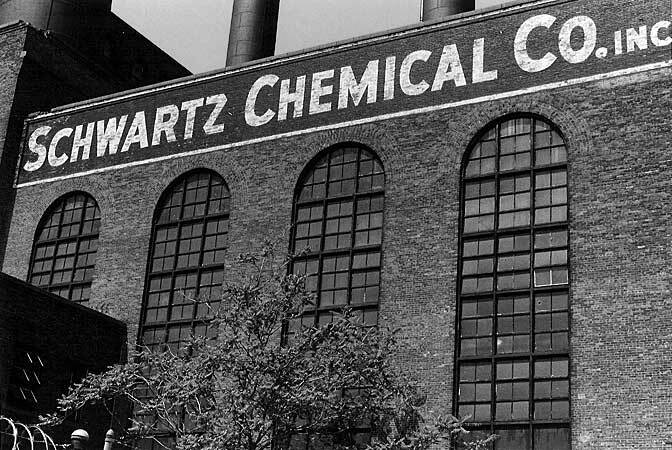 Schwartz Chemical was originally (from around 1944) located in Manhattan at 326 W. 70 St. (Schwartz Chemical's current (2002) web site claims "Serving Government & Industry since 1938.") Schwartz serves as consulting chemists and specializes in the manufacture of epoxies, cleaners, polishers, lacquers, dyes, cements and adhesives. They moved to this imposing factory building in Long Island City near the East River in 1959. The building was known as the Westinghouse Power Station (the interior mechanical systems were designed by the firm of Westinghouse, Church, Kerr & Co.). Its exterior was designed by the architectural firm of McKim, Mead and White and built in 1906 (according to Christopher Gray writing in the New York Times, May 22, 1988) or in 1909 (according to the AIA Guide to New York City, 4th edition, 2000) as a power generating plant for the Pennsylvania Railroad. It later served as a generating plant for the N.Y. & Queens Electric Light & Power Co., and is now (2002) occupied by "assorted manufacturing establishments and indoor tennis courts" (AIA Guide to New York City).